ROLAND P. LEARY and SOUTH SHORE PUMPING, INC. vs. CARVER BOARD OF APPEALS, DAVID J. BOUCHER, STEVEN McLAUGHLIN, JOHN STEWART and STEVEN W. MICHAEL. Plaintiffs, appealing under G.L. c. 40A, §17, seek to annul a decision of the Zoning Board of Appeals (the "Board") of the Town of Carver (the "Town") upholding a determination of the Inspector of Buildings of the Town (the "Inspector") denying plaintiffs a use permit under the Zoning By-Laws (the "By-Law") of the Town to construct a septage processing facility (the "Facility") on land off Montello Road in the Town. Plaintiffs also seek a determination of their rights to construct the Facility under the current zoning. A trial was held on July 1 and 2, 1991, at which a stenographer was appointed to record and transcribe the testimony. Twenty-three exhibits (some with multiple parts) were introduced into evidence, all of which are incorporated in this Decision for purposes of any appeal. The Exhibits included a Joint Trial Memorandum which included 19 agreed Stipulations. I took a view of the locus and of the Orleans Septage Facility, both on July 3, 1991. The following witnesses testified: Todd Chaplin, an engineer from E.J. Flynn Engineers (now called TWM Northeast) who is the Project Manager for the Facility; John P. Ryan, President and sole stockholder of New England Design and Construction Corp., which was involved with the design of the Facility and who has also been involved with the design and construction of about thirty-five wastewater processing facilities; Bryant Firmin, Chief of the Groundwater Regulation Section, Division of Water Pollution Control, Department of Environmental Protection for the Commonwealth of Massachusetts (the "DEP"), which regulatory body has issued a discharge permit (Exhibit 1, Stipulation 15; and Exhibit 4) and Webster Collins, Executive Vice President of Whittier Partners, an expert real estate appraiser, real estate counselor and a specialist in investment property, all appearing for Plaintiffs, and Philip Harlow, a residential real estate broker; Steven W. Michael, the Inspector; Thomas W. Russell, owner of a septic pumping service; Timothy McGillicuddy, Chairman of the Town's Board of Health; Arthur P. DeCoursey, a resident of North Carver; and John N. Stewart, a member of the Board, all appearing for Defendants. 1. Plaintiff, Roland P. Leary, is an individual with a principal place of business at 1076 Washington Street, Hanover, Massachusetts. 2. Plaintiff, South Shore Pumping, Inc. is a Massachusetts corporation with a principal place of business at 1079 Washington Street, Hanover, Massachusetts. 3. The Board is the reviewing authority for the Town for determinations made by the Inspector as to zoning matters. 4. Defendants Boucher, Stewart and McLaughlin are the members of the Board. 5. Defendant, Steven W. Michael, is the Inspector and has offices located at 19 Main Street, Carver. 6. On or about June 11, 1990, the Inspector sent notice (the "Determination") to Plaintiffs denying the Plaintiff's "Zoning Permit Application" dated May 31, 1990 (Exhibit 17) for the proposed use of Lot Numbers 2B, 4 through 11, 16, 17 (Assessor's Map #20), Lot Number 1 (Assessor's Map #22), and Lot Numbers 1 and 2 (Assessor's Map #23) (collectively the "Property") located in an industrial zoned district of the Town, for the proposed purpose of constructing the Facility. A copy of the Determination was introduced as Exhibit 17. 7. Plaintiffs requested reconsideration and the Inspector reiterated his determination. 8. Plaintiffs timely filed an appeal (the "Appeal") of the Determination with the Board as provided in G.L. c. 40A, §8. 9. On or about August 24, 1990, the Board filed with the Town Clerk its Decision (the "Decision"), in which the Board by a 2-1 vote, voted to overturn the Determination and to grant a permit to Plaintiffs. Only Defendant Stewart voted in favor of upholding the Determination. A decision to overturn required a unanimous vote pursuant to G.L. c. 40A, §15. A copy of the Decision was introduced as Exhibit 16. 10. Plaintiffs are persons aggrieved by the Decision because they have an agreement to purchase the Property from the present owners, John Mead, et als. That agreement has been extended to a date which is after final Judgement is to be entered in this action. 11. At all times relevant, the Property has been zoned as an industrial district. 12. A plan (the "Form A Plan") not requiring subdivision approval pursuant to G.L. c 41, Section 81P, was endorsed by the Town's Planning Board on January 30, 1990, and recorded with the Plymouth County Registry of Deeds on February 7, 1990 as Plan 110 of 1990, Plan Book 33, Page 186 (Exhibit 9). 13. Section 4.3 of the By-Law in effect on the date of endorsement of the Form A Plan (the "Old Zoning") sets forth the permitted uses in an industrial district as follows: "Any manufacturing or industrial use, including processing, fabrication and assembly, providing no such use shall be permitted which would be detrimental, injurous (sic), noxious or offensive or tend to reduce property values in the same of (sic) adjoining districts." 14. 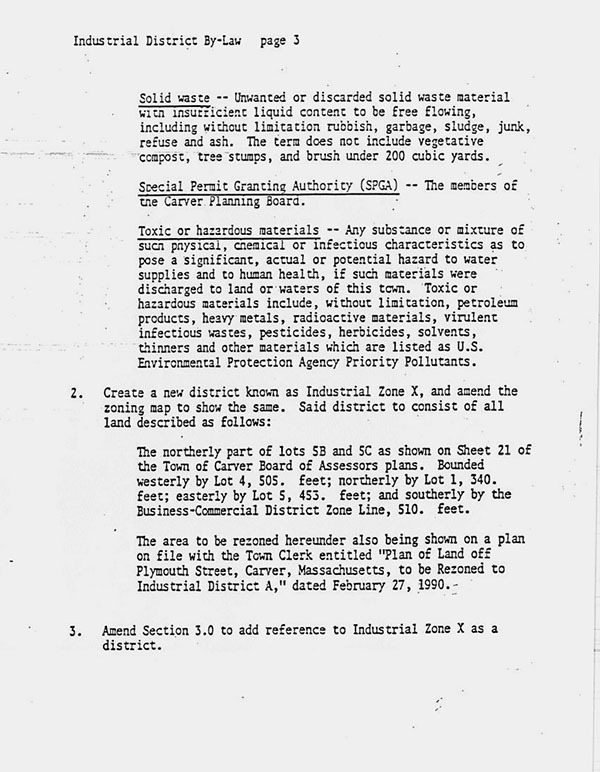 A Discharge Permit for the Facility from the DEP was introduced as Exhibit 4. 15. On June 6, 1990, the Town amended Section 4.3 of the By-Law as set forth on an attachment to this Decision (the "New Zoning"), which was introduced as Exhibit 18B. 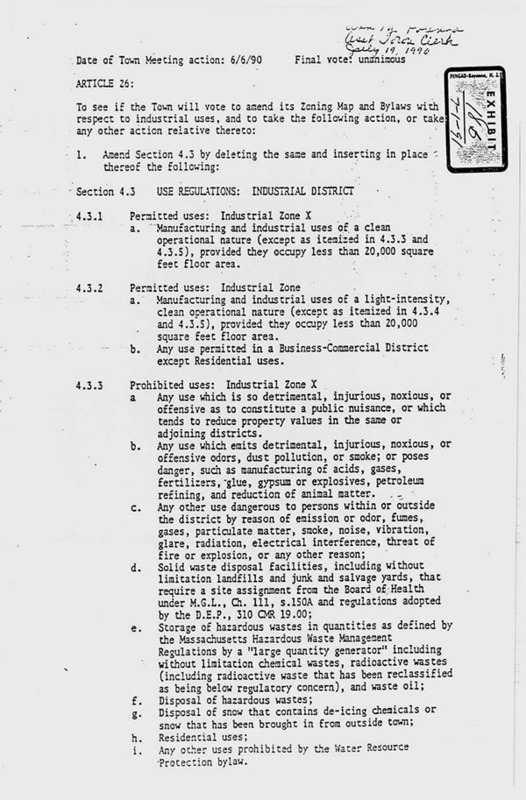 First notice of the amendment was published by the Planning Board prior to May 31, 1990. 16. On June 6, 1990, the Town adopted a Site Plan Review By-Law applicable to the Property. 17. Plaintiffs have complied with the Site Plan Review By-Law and obtained Site Plan Approval on September 20, 1990, a copy of which was admitted as Exhibit 10.
a) Whether the Old Zoning is applicable as a result of G. L. c. 40A, Section 6 (the "Zoning Freeze"); or whether the New Zoning is applicable. My decision is that the Zoning Freeze is applicable, that it protects the use provisions of the Old Zoning, that under those provisions the Facility is a permitted use, that otherwise the New Zoning applies and that under the New Zoning the Facility is not a prohibited use but does require a special permit. b) If the Old Zoning is applicable, whether the New Zoning has any applicability. See answer to a). c) Whether under the New Zoning a special permit is required for the Facility. Yes. d) Whether By-Law §8.5 requiring a special permit for "junkyard" is relevant to the Facility. No. 19. The parties have agreed that the Zoning Freeze is applicable to the Facility (see Stipulations in Exhibit 1 and pages 5 and 18 of Defendants' Post Trial Memorandum) and that accordingly the uses under the Old Zoning are frozen. They differ as to whether the Facility complies under the Old Zoning. 20. The New Zoning applies except for use provisions. The parties have argued whether the use provisions of the New Zoning allow the Facility. The parties have identified only one other aspect in which the New Zoning might apply - whether a Special Permit is required. The questions on this branch of the case are whether the Special Permit provisions apply to the Facility by their terms and, if they do, whether under Cape Ann Land Development Corporation v. Gloucester, 371 Mass. 19 (1976) they can apply to the Facility, given the Zoning Freeze. 21. The plans for the Facility were introduced into evidence (Exhibit 5) as were renderings of the Facility (Exhibit 6) and its Leaching Area (Exhibit 7) and a Site Plan (Exhibit 8). The Facility includes a two story office area at the front, behind which is a metal frame building enclosing the processing equipment, to the rear of which is a Discharge Enclosure. Just to the west of the building itself is a Leaching Area, fenced and screened to some extent by plantings. The immediate site area of the Facility is shown as 22 acres on Exhibit 8. The Form A Plan shows that the lot on which the Facility is to be located contains 117.17 acres. 22. Human waste passes into a septic system and there a certain amount of it is filtered and passes out to leaching pits or fields. What remains is septage, which is typically ten times the strength of the wastewater flowing into the septic system. The septage is pumped from the septic system into trucks. Septage from a number of septic systems would be collected in trucks and brought to the Facility for processing. The septage to be processed at the Facility will typically be residential. The Facility's Groundwater Discharge Permit also allows the processing of commercial sanitary septage but specifically prohibits industrial waste or hazardous waste. 23. Trucks would enter the building (the "Building") housing the Facility and, within the Building, would discharge septage through a direct connection into receiving tanks, thereby eliminating or making very small the likelihood of spills. Septage would then be pumped into large holding tanks, which are also fully enclosed in concrete below ground and not open to the outside or to air. From that point, septage would be processed through a plate and frame filter press which would de-water it; the filter press is located within its own enclosed room in the Building. 24. The Facility is designed to process 100,000 gallons of septage per day. It is estimated that there would be approximately twenty-five trucks which would travel to the Facility per day since most septage trucks are approximately 3,000 to 5,000 gallons, with some trucks being as small as 1,000 and some trucks being as large as 10,000 gallons. 25. Approximately 2% of the material would be removed at the filter press. The material which falls off the filter press is referred to as sludge cake or filter cake and is a dry material without any noticeable odor. The sludge cake will fall directly from the filter press into a truck which is to be underneath the filter press. This entire process occurs completely within the Building. 26. The filter press room is designed with odor control devices which pass the air through a four-stage, activated charcoal filter. The predominant odor, if any, which would be detected during the processing of the septage is the same musty, non­offensive odor which one would find when any body of water is contained in an enclosed building. There are unlikely to be any foul or offensive odors in the treatment facility and any odors should not be discharged to the outside of the Building, given the odor control devices. 27. The sludge cake would be hauled to a landfill approved by DEP and located outside of the Town. Sludge cake can be composted and used for landfill cover and other uses but composting is not involved for the Facility, since the sludge cake is to be transported off-site. Plaintiffs have not sought any permit to compost sludge cake at the Premises. 28. The remaining liquid is then processed initially through flow equalization tanks which are concrete tanks located underground and then to a series of rotating biological contactors ("RBCs"). An RBC is a device with a shaft which sits on a concrete tank. There are many plastic sheets attached to the shaft, which rotates very slowly. Biological growth occurs on the sheets and treats the liquid. 29. The liquid travels through the RCB's until it reaches a clarifier which causes any remaining solids to be dropped to the bottom of the clarifier and recirculated within the Facility for re-treatment. The liquid then travels through a rapid sand filter and then through an ultraviolet disinfection process. When completed, the water (the effluent) is discharged into open sandbeds. 30. The effluent which is discharged must meet Class 1 water quality standards set by the DEP, which means such effluent is drinking water quality. The effluent is discharged to the sandbeds so that it settles back into the ground. 31. The entire process, except for the discharge of the effluent to the sandbeds, is wholly contained within the Building or in sealed underground tanks. The only odor which would be detectable is the musty odor noted above, and that odor, if any, is to be contained within the Building. 32. The treatment of the septage is safe and environmentally beneficial. There are no hazardous chemicals utilized in the processing of the septage. The only chemicals to be used at the Facility are methanol used as a carbon source and polymers added to the filter press. There was no evidence introduced that either of these chemicals were hazardous and there was no evidence that any aspect of the treatment process was hazardous. The treatment of septage proposed at the Facility is proven and widely used throughout New England and elsewhere in the world. 33. There was ample testimony that the Facility is "state-of-the-art". Among other things, the Commonwealth's environmental determination (see below) refers to it as such. Mr. Firmin testified that the discharge permit applicable to the Facility (Exhibit 4) was stricter than most discharge permits issued and was among the strictest ever issued by DEP. The Facility was designed with numerous safeguards so as to operate properly and accomplish the task for which it was designed. 34. In addition, there was convincing testimony as to the type of protective measures to be employed in the operation of the Facility. The Facility requires licensed operators. Only licensed septage haulers would be allowed to leave septage at the Facility. Septage haulers must be licensed. Approvals of septage haulers must be obtained not only from the towns from which septage is accepted but also towns through which the septage hauler travels and the town in which the septage hauler disposes of the septage. 35. Before septage is processed in the Facility, there is a record keeping system identifying the source of the septage, allowing the operator to check to be sure where the septage came from. Also, a sample is taken from each truck and is tested by a device called a "microtox unit" which identifies whether septage contains toxic material which is outside of certain acceptable parameters. The test by the microtox unit takes place before any septage is deposited by the hauler at the Facility. If the microtox test indicates that the septage contains toxins, the load of septage will not be accepted at the Facility and the Town's Board of Health and the DEP would be notified by the operate of the Facility. 36. Also, a random sample would be taken from each truck for possible analysis by a laboratory. Although that analysis would take place after the septage is left at the Facility, if it contained inappropriate material, the septage hauler from whom the sample was taken would be identified and reported to appropriate authorities. Since a sample would be taken from each truck, a septage hauler would not know whether his sample would actually be sent to the laboratory. 37. The occurrence of unacceptable or "hot" loads of septage coming to the Facility would be infrequent. Bryant Firmin testified that in all of his experience, he is only aware of approximately five or six hot loads per year. Thomas Russell, Defendants' witness, stated that he never had a "bad load". 38. The Facility has been subjected to extensive regulatory review to date and will be subjected to further review if approved for zoning. An environmental notification form was filed with regard to the Facility under the Massachusetts Environmental Protection Act and on January 10, 1990, the Secretary of the Office of Environmental Affairs determined that no Environmental Impact Report was required (Exhibit 2). The approval process simultaneously proceeded through the Groundwater Regulations Section of the Division of Water Pollution control of DEP which resulted in the approval of the plans for the Facility (Exhibit 5), as well as the issuance of the Discharge Permit (Exhibit 4). The Discharge Permit governs not only the construction of the Facility, but also its operation. The Facility must operate within detailed parameters set forth in the Discharge Permit and the operator must be certified by the Commonwealth. The safeguards with regard to the operation of the Facility not only relate to the Facility itself but also to groundwater monitoring in the area around the Facility. Before operation of the Facility, but after its construction, approval, including the odor control system, must be obtained from the Air Quality Division of DEP. 39. The Property is a large, flat, barren site, most of which is a former gravel removal operation. A portion of the Property is still being used for gravel operation. There are also two stump dumps on the Property. A mostly worked-out gravel pit, the Property resembles a moon-scope. 40. The site is not located within the aquifer protection district established under the By-Law. The groundwater flow is away from the aquifer protection district and toward the Middleboro Landfill. 41. The site of the proposed Facility is not visible from neighboring residential roads. The facility would be constructed in an area which is approximately 1,000 feet from the nearest homes, which are located on Heather's Path in Plympton. (There was testimony that a Mr. Cole's home was located somewhere off Montello Road in Carver to the southeast of the Property, but it does not appear that he is substantially closer than 1,000 feet.) The Facility would not be visible from those homes since there is a heavily treed area between the Property and the homes and the homes are located on a higher elevation from the Facility. In the general area of the site there are three landfills, the Middleboro Landfill, the Raven Brook Landfill and the North Carver Landfill. 42. There was considerable evidence presented by Plaintiffs as to the relevance and applicability to this action of other treatment facilities. Although none of the other treatment facilities was identical in design, structure and operations, the other treatment facilities were similar in the processes being used. These facilities (except for Orleans) treat sewage rather than septage, but the difference does not appear critical. 43. While all of the other treatment facilities treated human waste with the same biological process to be used at the Facility, one difference involved the method of delivery of material to be treated ("influent"). The Orleans plant was designed to receive influent from trucks. The other treatment plants discussed including the Sea Crest Hotel in Falmouth, Fuller Pond Condominiums in Middleton, MA, South Port Village in Mashpee, MA and Sumner Hills in Plymouth are "end of the pipe" ("EOTP") facilities (influent is delivered to the facility directly from its source by means of a direct pipe). 44. EOTP facilities are less desirable than truck delivery facilities (such as the Facility) because if an EOTP facility ceases to be in compliance with its discharge permit or otherwise fails to operate properly, as a practical matter it cannot be closed down, since it is constantly receiving human waste directly from the dwelling units in the complex in which it is situated. 45. If an EOTP facility is closed, either the influent backs up into the residences or it overflows when it reaches the treatment plant. If a truck delivery facility is not in compliance with its discharge permit or otherwise does not operate properly, it can be closed without any danger to the public health. The only result would be that septage haulers would not be able to dispose of septage at that particular facility but, rather, would have to haul it to another approved disposal site. The closing of the facility would be financially damaging to its owner, providing a substantial incentive for proper operation. 46. Truck traffic should not be an issue as to the Facility, given the amount and quantity of heavy gravel trailer dumps which presently travel in and out of North Carver, not only from the Premises, but from the other operations in the general area of the Premises. Trucks bound for the Facility will travel on Montello Road, passing the entrance to Heather Path and other residential roads which lead off Montello Road, but not travelling in the residential roads. Defendants raised the question of spillage from the trucks but the threat of that does not appear substantial. 47. All of the treatment plants as to which testimony was given were located substantially closer to residential dwellings than would be the Facility. 48. The only real issue with regard to whether the Facility would be detrimental, injurious, noxious or offensive related to the issue of odors. Concern over odors allegedly occurred as a result of a visit to Orleans by the Inspector. The Orleans facility, although a truck delivery facility, is designed substantially differently from the Facility. The Orleans facility (Exhibits 14A and 14B) does not have the entire treatment process completed indoors: after the influent passes through the filter press it is delivered to RBC's outside the building, which are exposed to the outside air except for a cover over the RBCs. Accordingly, if the RBCs were not operating properly and an odor was emitted, that odor would be directly transmitted to the outside air since there is neither an enclosure (other than a fiberglass cover) to contain the odors nor any odor control equipment to treat such odors, if any. 49. That odors were a central issue in this matter appeared from the testimony of the Inspector, who stated that except for the issue of odors, he felt that Plaintiffs' Facility likely was a permitted use at the Premises. 50. Testimony from all of the Plaintiff's witnesses indicated that treatment plants which are located in residential complexes do not have odor problems. Several of Defendants' witnesses testified that there was an odor problem at the Orleans facility. I observed none on my view. 51. The treatment plant at Sea Crest (See Exhibits 11A­ B) is located across from the main entrance of a luxury hotel and by a children's playground. The Fuller Pond treatment plant is located within a complex of luxury condominiums (See Exhibits 12A­ D). South Port (under construction), which is to have 1.7 times the daily capacity of the Facility, is located near residential areas (Exhibits l3A-13C). The Sumner Hill treatment plant is located within a residential complex (See Exhibits 22A-D). White Cliffs Condominium, which also contains a treatment plant of approximately 80,000 gallons per day (Exhibit 19), is located in a residential complex. There was no testimony that any of those treatment plants, which use the same general processes as the Facility, are detrimental, injurious, noxious or offensive. In summary, treatment facilities are often located in residential communities (i.e., much closer than the Facility to its neighbors) without apparent odor or other problems. Such problems as have been encountered at Orleans appear to be temporary or attributable to differences in the treatment processes from those of the Facility. 52. Mr. Firmin testified that the DEP is satisfied as to the Facility's odor control measures. I conclude that there should not be offensive odor inside the Facility, that any odor will not escape the Facility and that, in any event, because of the location of the Facility, any odor from the Facility would not be a problem outside the Property. 53. The Facility will fill a clear need and will be a definite improvement over existing treatment facilities. Many communities dispose of their sewage or septage in open leaching pits, which are inferior to the Facility from health and environmentalstandpoints. The Commonwealth's MEPA determination states that development of the Facility will allow for the phasing out of an existing significantly less efficient anaerobic lagoon system operated by Plaintiff, South Shore Pumping, Inc.
54. There was conflicting testimony as to whether the Facility would "tend to reduce property values in the same or adjoining districts." Webster Collins, Plaintiff's witness, testified at length as to his reasons for concluding that the Facility would not. Mr. Collins is a real estate appraiser and consultant of extensive training and experience in all aspects pertinent to the question at hand. He concluded that the distance separating the Facility from its residential neighbors, the nature of the site, the nature of the treatment process and the safeguards imposed by regulatory authorities are such that property values will not tend to be lowered. 55. Defendants' witness, Philip Harlow, is a real estate broker who has been active in the Carver area for about seven years. He did not qualify as an expert witness. He has sold many houses in Carver, but none in Plympton (where the nearest residences are located). He was able to testify as to lost sales of houses directly opposite the North Carver landfill, based on the existence of the landfill, and the reaction to the Facility of one owner on Heather Path. He did not evidence much familiarity with the Facility. The main purport of his testimony was that there would be a stigma attached to any facility labelled "septic" or "septage". 56. I find Mr Harlow's testimony unconvincing. Perception plays some role in value but the By-Law should not be read as automatically vetoing any septage facility, which is where Mr. Harlow's logic leads you. If the By-Law meant to outlaw any septage facility, no matter where located and how carefully controlled, it could say so, but it doesn't. 57. I find and rule that the Facility is a manufacturing or industrial use (there was no contention to the contrary by Defendants on that point), that it will not be detrimental, injurious, noxious or offensive and that it will not tend to reduce property values in the same or adjoining districts. It is thus an allowed use under the Old Zoning. 58. What is the status of the Facility under the New Zoning? Section 4.3.3 of the By-Law defines as permitted uses in an industrial zone: "Manufacturing and industrial uses of a light-intensity, clean operational nature (except as itemized in 4.3.4 and 4.3.5), provided they occupy less than 20,000 square feet of floor area." 59. I find and rule that the Facility is a "Manufacturing and industrial use of a light-intensity, clean operational nature". Indeed, Defendants have not suggested to the contrary. The By-Law's definition of "floor area" (Exhibit 18C) is "that area defined by the outside dimension of the building exclusive of garages and unenclosed areas". The Facility's building has a floor area of 16,675 square feet, if the office portion is counted only once and 19,375 if it is counted twice, as having a second story (Exhibit 8 and testimony of Mr Chaplin). The Facility therefore passes the 20,000 square foot test. 60. Is it a use itemized in 4.3.4? 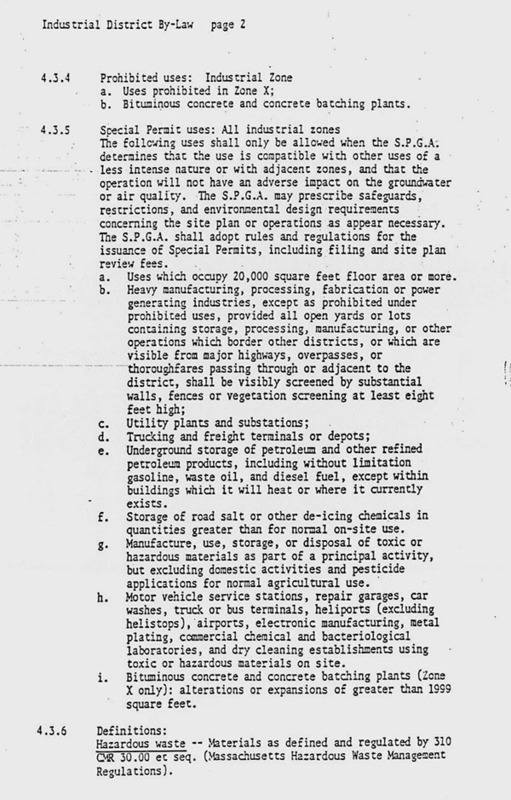 That section prohibits bituminous concrete and concrete batching plants (clearly not an issue here) and uses prohibited in Zone X. That throws us back to Section 4.3.3 ("Prohibited uses: Industrial Zone X"). Defendants have pointed to subsections (a), (b) and (c) of Section 4.3.3 as barring the Facility. The text of those is included on the attached. 61. The Facility does not come within any of those prohibited uses. Subsection (a) is much like the standard established in the Old Zoning, only tighter, and I have found above that the Facility complies with the Old Zoning. As to Subsections (b) and (c), I have found that the Facility will not constitute an odor problem and the evidence establishes that the Facility will not be dangerous. 62. Is the Facility a use itemized in Section 4.3.5 (see the attached text)? Defendants suggest subsections (a) through (d), (g) and (h). As to (a) and (b), the Facility is under 20,000 square feet and it is light, as opposed to heavy, manufacturing, etc. As to Subsections (c) and (d), the suggestion that the Facility is a utility plant or substation or a trucking or freight terminal is frivolous. Defendants fasten on (h) because of the reference to "bacteriological", but the complete reference is to "bacteriological laboratories", which the Facility is not. Defendants apparently abandoned their original suggestion that the Facility might need a Special Permit because it was a junk yard; I am happy their rethinking led to that result. 63. The Facility does run afoul of subsection (g), however: "... use, storage or disposal of toxic or hazardous materials as part of a principal use..." I reach this result because of the definition of "toxic or hazardous materials" (see the attached). Human waste is a "substance of such physical ... or infectious characteristics as to ... (pose a health hazard) ... if discharged to land or waters of" the Town. The second sentence of the definition indeed lists substances of markedly greater hazard than human waste but their listing is expressly "without limitation" and thus not exclusive. 64. The Facility therefore requires a special permit, in this instance, from the Planning Board (see By-Law section 4.3.6). Plaintiffs suggest that return to the Planning Board would be redundant, in light of that Board's unanimous action in granting favorable site plan review to the Facility (Exhibit 10). The results may end by being substantially, or perhaps even totally, the same, but the scope of inquiry suggested by the introductory language of Section 4.3.5 of the By-Law (see the attached) is broader than the site plan review by-law (Exhibit 18D). 65. The Planning Board will, of course, be aware that it must operate within the confines suggested by the Supreme Judicial Court in Cape Ann Development Corp. v. City of Gloucester, 371 Mass. 19 , at p. 24. The Special Permit may not be denied because of the Facility's use, and conditions imposed, if any, may not individually or collectively amount to a practical prohibition of the use. 66. I will retain jurisdiction to deal with any appeal of the Planning Board's action. 67. If there is an unappealed grant of a Special Permit by the Planning Board, the Inspector is to grant a building permit for the Facility. To the extent the June 11, 1990 determination of the Inspector is based on the premise that the Facility is a prohibited use, the Decision of the Board upholding the Inspector's determination is annulled.